Don't Drive to Dinner: New Orleans - First isn't always best! I must start by telling you we've had some fantastic meals here in New Orleans - and I'll tell you all about those soon. We've also had some, well, interesting experiences here too. Like all good foodies, I'm both a sucker for local specialities and a bit of food history. If somewhere that tells me it's the 'home of the original ...', then it's going on my 'must visit' list. We started ourselves off gently, with Pat 'home of the original hurricane' O'Brien's. Now, we like our cocktails, but the hurricane was new to us. We should have guessed we weren't on for a subtle experience when we arrived in the courtyard to be presented with a flaming fountain. 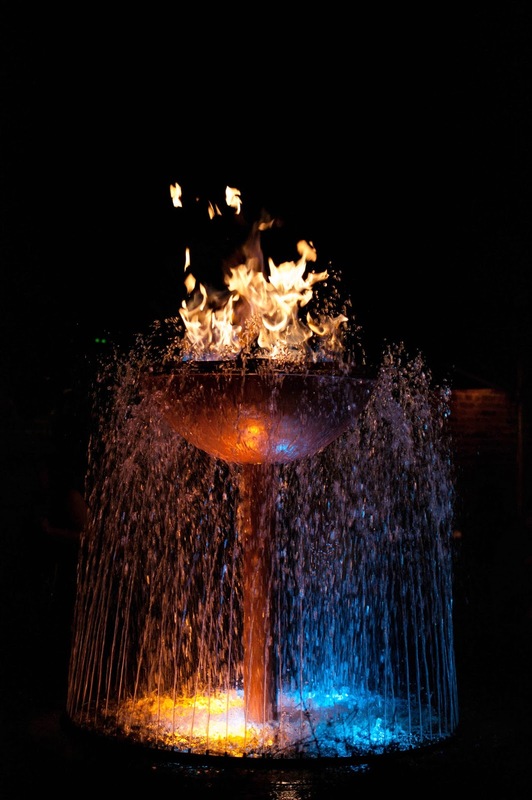 Yup, both water and fire - and both awesome and tacky. The drink itself? Simply fruit juice and a lot of rum (apparently, it was invented to use up cheap rum imports from the Caribbean) - and remarkably popular. Much too sweet for my tastes, and potentially deadly. It comes in a special glass you're allowed to take home. Hmm. Staying on the theme of cocktails, we also went to Napoleon House - a bar that epitomises New Orlean's shabby, gloomy chic. Here we're after their Pimms and lemonade - a popular drink in the UK, but unusual in the US outside of New Orleans. And - darn it - we weren't impressed. Their Pimms Cup is made with fresh lemonade - which might sound like a good idea, but the bitterness completely drowns out the subtle taste of the Pimms. I guess if you're after alcoholic fresh lemonade, it kind of works, but it didn't work for us. (Best Pimms Cup? We reckon Tableau on Jackson Square). 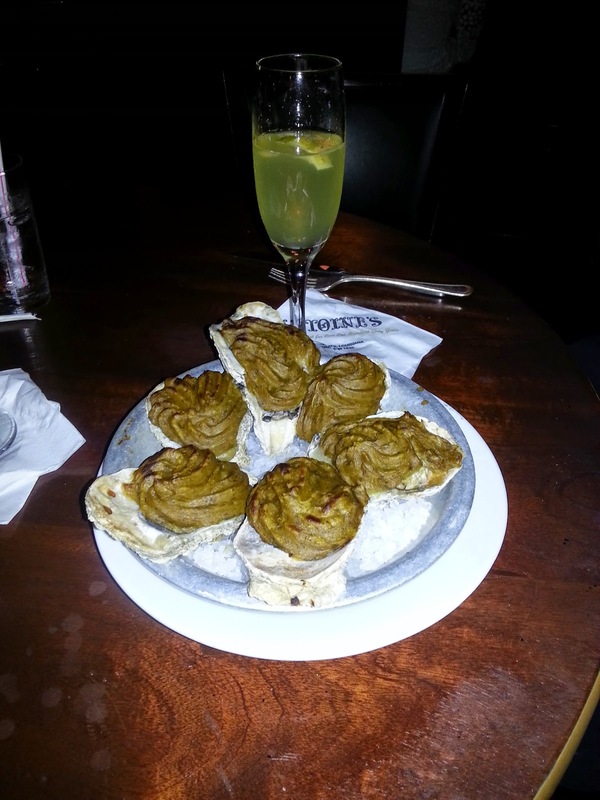 From there we went to the Hermes Bar, part of Antoine's, home of the Oyster Rockefeller. Now, not only is this the home, but it's the only place in the world you can get this delicacy. The recipe is apparently a closely guarded secret. All they'll tell is that it doesn't contain spinach (err, okay). Apparently, imitators have used laboratories to analyse the ingredients - and over three million of them have been sold. Well, I hate to say this, but I don't think they'll be selling any more to us. On top of our oysters there was a large pile of piped green gloop. I'm struggling to find a pleasant metaphor to use here. Instead I'll just tell you it was bitter, salty and actually rather unpleasant. We're obviously completely missing something here. It also produced probably the most dreadful photo of the trip so far! (The best oysters? For us, it was Acme Oyster House on Iberville Street). But trust us, there's lots of delicious food here in New Orleans - just remember that first isn't always best, and unique isn't always good!